Even black conservatives are subjected to the hate-Trump actions of the uncivil Left. These two conservatives were proudly sporting their MAGA hats and were refused an Uber ride according to their interview. Discrimination based upon political persuasion is fairly new on the American scene. The liberal progressive left no longer can or will debate the issues on their merits. Everything that is not according to their narrative is not deserving to exist. The Democratic leadership and the mainstream media are purveyors of this hate and are keeping it stirred for political gain. There was no reason for the Uber driver to deny them the ride. 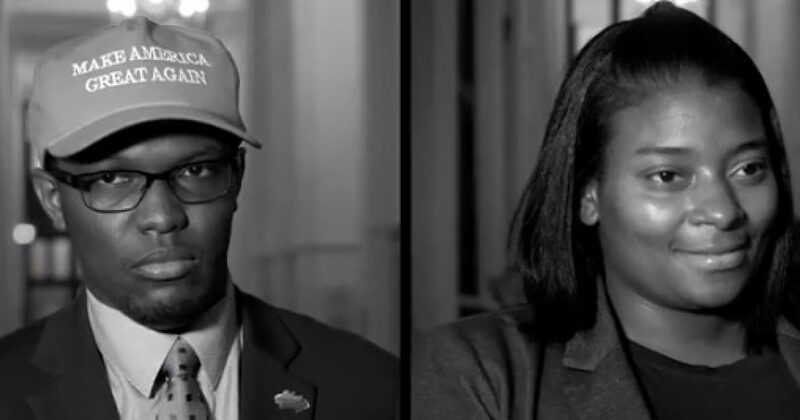 Matthew Handy and Adria Barrington discovered it is not always easy to be a black conservative who supports President Donald Trump in Washington, DC. Handy and Barrington were part of the Rocky Mountain Black Conservatives’ summer intern program. The program, which just wrapped up last week, affords young, black conservatives the opportunity to work with like-minded members of Congress and at conservative think tanks in the nation’s capital. Handy, 20, hails for Hopkinsville, Kentucky where he is a student at Hopkinsville Community College. He was an intern for Rep. Mike Boss (R-Ill). Barrington, 33, had a career as a correctional officer in Florida before turning to politics and worked in Rep. David Schweikert’s (R-AZ) Capitol Hill office. They never expected that their journey would include facing discrimination because of their political beliefs. But that changed when Handy and Barrington and another friend ordered an Uber to take them to Trump International Hotel for a Make America Great Again meetup. The driver spotted their MAGA hats and allegedly refused to give them a ride.